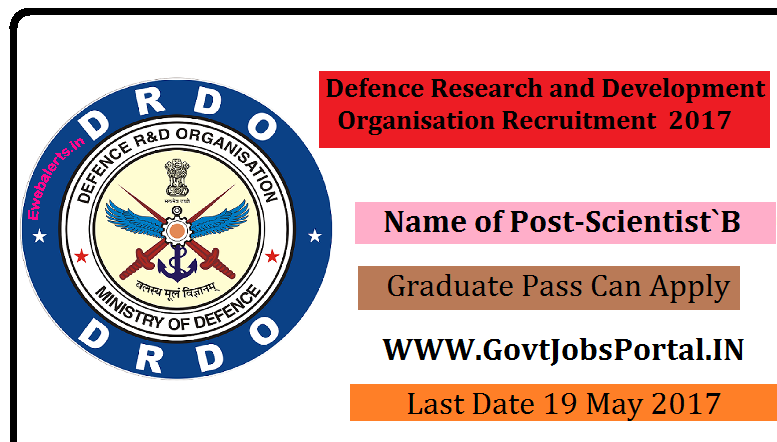 Defence Research and Development Organisation is going to recruit fresher candidates in India for Scientist`B Posts. So, those candidates who are willing to work with this organization they May apply for this post. Last Date of Apply 19-May-2017. Total numbers of vacancies are 23 Posts. Only those candidates are eligible who have passed First Class Bachelor’s Degree in Engineering or Technology in Aeronautical Engg/Computer Science & Engg/Electronics & Communication Engg/Mechanical Engg/Instrumentation Engg/Civil Engg/Naval Engg from a recognized university or equivalent anfd Valid GATE 2015/ 2016/2017 Score. Indian citizen having age in between 20 to 33 years can apply for this Defence Research and Development Organisation Recruitment 2017. Educational Criteria: Only those candidates are eligible who have passed First Class Bachelor’s Degree in Engineering or Technology in Aeronautical Engg/Computer Science & Engg/Electronics & Communication Engg/Mechanical Engg/Instrumentation Engg/Civil Engg/Naval Engg from a recognized university or equivalent anfd Valid GATE 2015/ 2016/2017 Score.